It was this week that the biggest urban Art work in Lisbon was inaugurated. André Saraiva revealed the new mural, on which he spent the last two years working on, at one of the most popular neighbourhoods in town, São Vicente de Fora, neighbour to Panteão Nacional and to the popular weekend's flea market. The wall with 864 m2 (9300 sq m) was covered with more than 50,000 handmade tiles. The work, commissioned by the city council and MUDE (Design and Fashion museum) is a representation of André's Lisbon imaginary, in a optimistic and playful approach. The mural is filled with André's references, not only Portuguese and Lisbon ones, but also some others that are part of the artist's path and life, such as Paris and New York, referencing the times he has been living there; Places where André rambles, filled with his fantasies and dreams, such as giant wine bottles and Jacques Prévert books. This art work sums up indeed who André is. A free and pop spirit, irreverent and a fast living one. Born in Upsala, from Portuguese parents, grown up between Portugal and Paris, now established in New York. For some artists, canvasses or paper are the support for their creativity, for André it has always been walls instead. Started as an urban artist, writer, he now has achieved his dream (as he confessed to Barbara Coutinho, MUDE's director) to have a big wall in Lisbon, that will not be as ephemeral as the graffiti. Challenging his own techniques as an artist, the mural is also challenging eternity and the artist's presence throughout time. 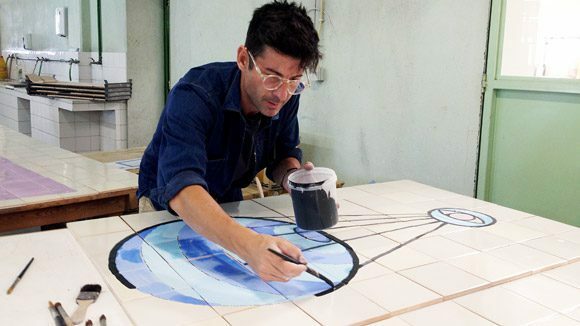 Furthermore, the installation comes not only as a gesture of support for public art, but also a moment to celebrate the Portuguese tradition to paint tiles and, as André proudly claims, it is a gift to the city.